Each week a featured host will be bringing you a set of features. This week I got to choose! Before we get to this week, let’s meet the hosts! Now for the features courtesy of Cassie! This week I noticed quite a few fun and easy sewing projects were submitted! I love to sew (although let’s be honest, I’m nowhere near as talented as Lisa…) but I still find it fun. And I do have an addiction to buying fabric so I’m always looking for ideas of what to make. 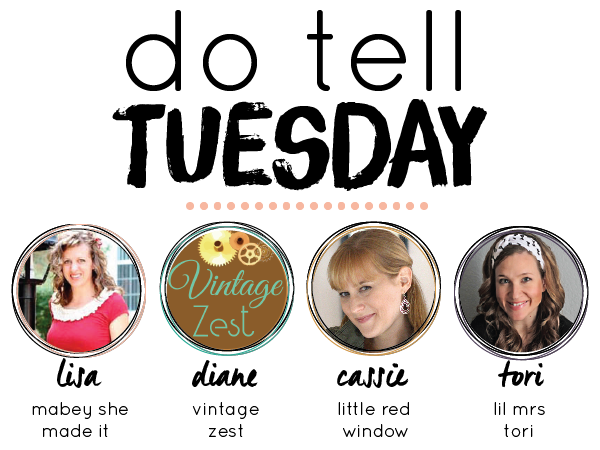 Here are my favorite sewing projects from last week’s Do Tell Tuesday! Thanks for sharing everyone! Hey Tori – Hope all is well with you and your family. Thanks for the feature on my asymmetrical color block tote! Have a great week! Hey girl! Love your link up! Did you know that part of your page is cut off though? Just thought I would give you a heads up!